Some 250,000 Bedouin Arabs are residents of the Negev region today; approximately 100,000 of them live in villages that are unrecognized by the Israeli government. These unrecognized villages, because they lack official status, endure conditions of extreme deprivation due to severe discrimination in state budgets, in resources and in planning. 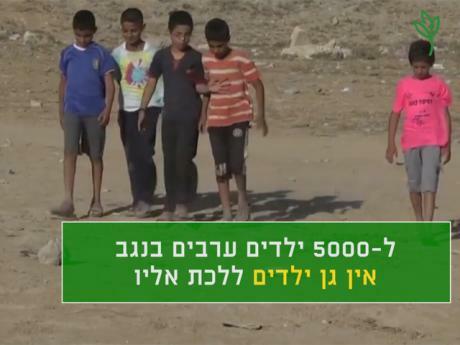 As of 2017, about 5,000 Bedouin children of school age in unrecognized villages cannot attend kindergarten; the dropout rate for Bedouin students at Negev high schools is the highest in Israel – 36% as of 2014 (6 times the dropout rate for Jewish students). Dozens of unrecognized villages are cut off from public transportation services, and even in recently recognized villages, public transportation services are sparse. 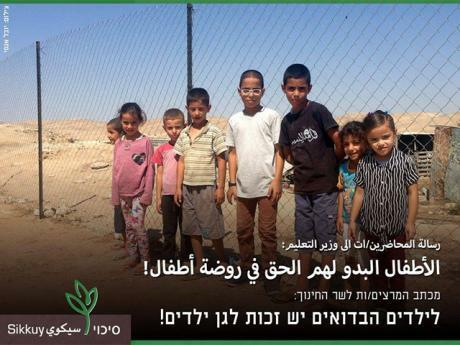 Under these circumstances, it is no wonder that Negev Bedouin-Arab society is the most poverty-stricken group in Israel, with the lowest level of employment. High-quality, accessible education and public transportation are among the most basic rights of every citizen of Israel, with no connection to place of residence. Moreover, these services are crucial preconditions for participation in higher education, in the labor market, and in society at large. We believe that these basic, crucial services can be developed, despite the planning and legal hindrances, even before reaching a comprehensive agreement on the recognition of these villages and a fair and appropriate planning solution for all their residents. In cooperation with the Regional Council of Unrecognized Villages, we are working,\ vis-à-vis the Ministry of Education to advance a blueprint for establishing kindergartens in mobile structures in every unrecognized village and in neighborhoods of recently recognized villages, and high schools in the existing service centers among the unrecognized villages. We are also working vis-à-vis the Ministry of Transport to remove barriers to the paving of roads that will enable the introduction of public transportation within the unrecognized villages, and promoting the establishment of additional bus stops placed along the main roads in the area, near the entrances to the villages. Thus far we have mapped the barriers to be addressed in these two areas – education and public transportation – and we are working to advance our policy recommendations with the Ministry of Education , the Ministry of Transport and the Ministry of Agriculture. We are participating in sessions of the Knesset education committee and the public transportation subcommittee and are pursuing discussions on practicable solutions to problems that thus far the Israeli government has not succeeded in resolving. Ella Gil joined the Equal Policies department at Sikkuy in November 2018, as the "Promoting Equality in the Negev" project coordinator. Ella has a first degree in Environmental Studies and a second degree in Geography and Urban Planning, both from the Hebrew University in Jerusalem. 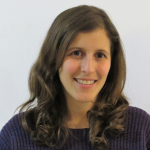 Ella brings her rich professional knowledge and diverse experience from her work as an urban planner in private sector companies; the Urban Clinic at the Hebrew University, and from her involvement in numeral projects of communal planning and promoting planning policies for early childhood. Ella has participated in different social and communal projects. Today, she is a partner in “Placemaking” project (planning and creating a communal space with citizens’ involvement) through “Moslala” association, which established “Eden Rooftop”- a demonstration and content center for urban ecology. Ella resides in Jerusalem.